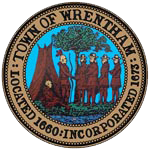 WRENTHAM — Town Administrator Kevin Sweet is pleased to announce that he has been reappointed to a second term on the Governor’s Local Government Advisory Commission. The Massachusetts Local Government Advisory Commission (LGAC) analyzes proposed legislation affecting cities and towns, acts as an advocate for the interests of local governments and advises state officials on their needs. The commission meets regularly with the governor and state legislative leaders. The LGAC is a model that the rest of the nation has looked to as a major success in facilitating strong local-state relations. In addition, Town Administrator Sweet serves as an Elected Director on the Massachusetts Municipal Association (MMA) Board of Directors and is the District 5 Representative on the Massachusetts Municipal Management Association Executive Committee.